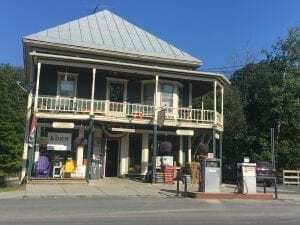 Walking up to Harry’s Hardware in Cabot, Vermont, feels a little like walking back in time: a single gas and diesel pump, unadorned and unsheltered, stand out front; the wood floors, worn smooth, buckle slightly between the boards; red tractor seats line a glistening granite bar. Yes, a bar. In a hardware store. But it’s not just any hardware store. Harry’s Hardware, established in 1896, is quintessential Vermont. It serves the community of Cabot, which, with a population under two thousand, is tight-knit and hardworking. Sit at the bar and see. In the course of thirty-five minutes, one local, dressed in work clothes and sporting the Cabot Creamery logo, stops by to pick up power steering fluid. Another man stops in several minutes later needing a key made. But what makes Harry’s Hardware unique, even for Vermont, is that after you’ve picked up the duct tape and nails, you can sit down and have a beer with your buddy. This idea, which is surprisingly novel, also seems somewhat obvious: small towns are about community, and community happens in between and after work, when we sit down for a minute, and socialize. Harry’s bar, known as The Den, is the result of much brainstorming from husband-wife duos Bobby and Stephany Searles and Joanna and Rory Thibault. Their excitement is contagious. According to the internet, Bobby and Joanna have only found two other hardware stores that also sport a bar, and both are located in Oregon. They believe they may be the first to do it in Vermont. In fact, they were told that they were the first hardware store in Vermont to be issued a cabaret (beer and wine) license. The tap list, which is eight items long, includes Zero Gravity, Lost Nation, Switchback, Citizen Cider, and other Vermont based beers. Bobby and Joanna believe that the bar will be the main draw for visitors. However, they also plan to continue to appeal to their local base by keeping the hardware part of the store active. Maintaining community engagement is important for Bobby, Stephany, Joanna, and Rory. In 2006, Bobby Searles and his wife Stephany bought the Cabot Village Store. In 2012, their neighbor, Harry’s Hardware, closed. The flooding that occurred in 2011 thanks to tropical storm Irene, had left the place with a fair amount of damage. Even the gas tanks out front needed to be replaced. Bobby and Stephany were worried; what would happen to the community if there was no place in town to get gas? And so he and Stephany bought the hardware store, because, really, what else could they do? After Bobby and Stephany got the store up and going again, they tried to sell it for three or four years. But no one was biting. Then Joanna and Rory Thibault moved to town. Joanna and Rory, who recently retired from active duty, bought a house across the river and fell in love with the town of Cabot. With all the work their new home needed, they were frequent visitors to Harry’s Hardware. And they all started talking. They started talking seriously in January. They knew that for their idea to work, they really needed to be there for each other, that neither couple could do it alone. And so they decided to partner up and give it a try. The addition of The Den to Harry’s Hardware is symbolic of our times: for small towns to continue to thrive and flourish, it takes native Vermonters and enthusiastic transplants, it takes creativity, and adaptability, and it takes a commitment to honoring the past while moving towards the future.